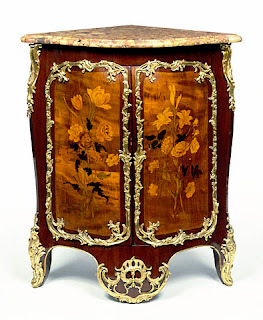 An ébéniste used various brilliantly colored exotic woods and stained native woods to create the floral marquetry on the doors of these corner cupboards. 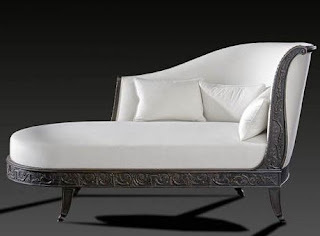 Ébénistes specializing in this type of work, such as Jean-François Oeben, sometimes sold such panels already made and ready to be glued onto a piece of furniture. Oeben used the grain of the wood to create the effect of movement in a leaf or a petal. Tulips, carnations, roses, lilies, and daffodils are recognizable in his naturalistic bouquets. 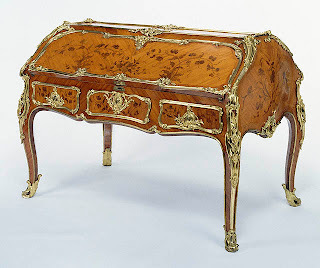 Elaborate gilt bronze mounts of interlaced flowers and branches, designed by a specialized sculptor and made by a bronze caster, set off the marquetry panels.